Please read our terms and conditions of carriage very carefully. Take note TCG’s LIABILITY IS EXCLUDED as well as that of its employees or agents for loss, damage and delay in certain circumstances. TCG’S LIABILITY IS LIMITED to stated amounts where liability is accepted. STRICT TIME LIMITS apply where NOTICE OF CLAIMS is required. It is your duty to obtain insurance cover to protect your interests. Words denoting, the singular include the plural and vice versa; any gender include the other genders, and persons include corporations and bodies politic and include their legal personal representatives and assigns. TCG shall not be a public or common carrier in relation to the carriage of goods forming the subject of these conditions and any goods carried are accepted subject to the conditions herein. These conditions supersede all previous published terms and conditions. These conditions supplement and detail the general terms and conditions on the back of TCG waybills and other publications. In case of conflict between these conditions and the conditions on any TCG waybill, manifest, shipping label or other transit documentation, these conditions govern to the extent that they do not conflict with the mandatory rules relating to liability for carriage provided by the laws of South Africa. TCG reserves the right to unilaterally modify, amend, change or supplement these conditions without notice. No amendment or consensual cancellation and/or variation of any of the provisions or terms hereof and no extension of time or waiver or relaxation of any provisions of this agreement shall be binding unless recorded in a written document signed by a duly authorised director of TCG and a duly authorised representative of the Customer. All business undertaken including guidance, information or service provided by TCG shall be subject to the conditions set out and each condition shall be deemed to be incorporated in and to be a condition of this Agreement between TCG and the Sender of the goods. The Sender confirms that it does not rely upon or claim any other terms, warranties, conditions or representations relating to the use of the services under this Agreement. The Sender will be bound by the signature of any of its employees, servants and agents on the TCG Waybill. Goods are accepted subject to the conditions stipulated by all other carriers, sub-contractors, handlers and any other parties into whose possession or custody they may pass to finalize and deliver goods that come into their possession. Under no circumstances shall any strict liability attach to TCG. TCG reserves the right to transport the goods received from any Customer and/or the Sender by any means at its disposal and may use any carrier to perform its duties. All goods that require forwarding to facilitate delivery may be held at TCG’s discretion and the Customer and/or the Sender’s cost until suitable delivery arrangements can be arranged. TCG is entitled to use independent parties to perform any of the functions required for completion of its duties. TCG shall have no responsibility or liability to the Customer and/or the Sender for any act, or omission of such third party even though TCG may be responsible for the payment for such third parties charges. TCG however reserves the right to, at its sole election, take action on behalf of the Customer and/or the Sender should the independent carrier fail to carry out its duties suitably. The costs associated with taking such action would be for the account of the Customer and/or the Sender and are payable on demand. The customer shall be obliged to give any instructions to TCG timeously and in writing in order to afford TCG a reasonable opportunity to comply with such instructions, but TCG shall be entitled, but not obliged, to act on oral instructions alone. If there is a conflict between any oral or written instructions or between the various written instructions themselves, or in the absence of instructions, TCG shall determine the course to be adopted, in its sole discretion, having regard to the Customers known requirements, if any, and if not it is recorded that Overnight Service shall be the default service selected. Notwithstanding that TCG may purport or attempt to act on any instructions, no liability shall attach to TCG for failure, whether negligent or otherwise, to perform such instructions. TCG shall be entitled to recover its charges and/or expenses including those incurred acting in terms hereof. All quotations, rates, tariffs and surcharges are subject to withdrawal or revision by TCG at any time. TCG shall be at liberty to revise all quotations, rates, tariffs or surcharges with or without noticing cases where TCG’s costs are affected by any of its suppliers and may do so without notice to the Customer. Charges are calculated on the basis of either actual or volumetric mass, and for purposes of rating, the greater of the two calculations is deemed to be the chargeable mass for the purposes of measuring the volume, mass and/or dimensions of any package. The measurements as calculated by the dimensions machinery and/or company representative will be regarded as conclusive proof of the volume, mass and/or dimensions of the package so measured. Only written quotations provided by TCG will be valid. If any goods have not been accepted or collected by the Recipient and/or its nominee within a reasonable time after the tender thereof, and for the purposes thereof notification to the Recipient and/or its nominee of the fact that the goods are available for collection or that TCG is willing to deliver the goods shall be deemed to be a good and sufficient tender, TCG shall notify the Customer at its legal address (domicilium citandi et executandi) and, after the expiration of ten (10) days from the posting to that address of such written notice and unless the Customer shall give TCG instructions to redeliver the goods, at the Customer’s expense, TCG shall be entitled and authorised irrevocably and in re suam, to sell or dispose of the goods and retain from the proceeds the charges, expenses and costs incurred in the carriage thereof. TCG and /or its nominee reserve the right to open and examine any goods tendered to fulfil security obligations at any time. TCG’s rights under this clause are not exhaustive and are in addition to any other rights which it may have against the Customer. If it is necessary for an examination to be conducted by TCG in respect of any discrepancy in the goods which are landed from any vessel, aircraft, vehicle or container, the responsibility to comply with any regulations, laws and/or obligations pertaining to the goods remains that of the Customer and/or the Sender, notwithstanding the contractual relationship between TCG and Customer and/or the Sender. TCG does not accept or courier packages which exceed the size limitation being 1m x 1m x 1m and the weight limitation being, 50kgs. adequately and clearly address each consignment to enable effective delivery thereof. The onus of establishing the conditions of the goods at the time of delivery thereof by TCG shall rest with the Customer and/or the Sender. Without limiting the generality of the aforegoing, TCG shall be entitled to delay the dispatch of any goods or expedite the date of dispatch if they, in the sole discretion of TCG, consider it necessary for the safety of the goods or if, in the sole discretion of TCG, there is a backlog of goods with higher priority and/or any other reason. TCG will only deliver goods that are the property of the Customer and/or the Sender and the Customer and/or the Sender warrants that it is authorised to accept and its accepting these conditions not only on behalf of itself, but also as agent for and on behalf of all other persons who are or may become interested in the goods. The Customer and/or the Sender hereby undertake to indemnify TCG against any damages, costs and expenses resulting from any breach of this warrantee. TCG shall not be liable whatsoever for any loss or damages howsoever arising in respect of late or non-delivery of any goods. Is due to the negligence, intentional and/or willful act or default of TCG or its employees. Loss or damage to any parcel exceeding the prescribed size or weight limitations being 1mx1mx1m, and 50kgs. Notwithstanding anything to the contrary contained or implied in this clause 11 (eleven), No assumption of liability by TCG is extended to the following: mechanical or electrical goods unless contained in brand new and original packaging. Antiques or antiquities of any description, arms, ammunition, live animals of any description, bank and treasury notes, bullion, bulk cargo of any description, cash, deeds, designs, documents, explosives, furs, gold bullion, silver nuggets, models, molds, patterns, plans, precious metals, specie, travelers cheques, brass and scrap metal, seafood, fresh produce, frozen goods, aircraft unless TCG agrees in writing prior to the goods being tendered to accept liability for the handling of the items listed in this clause. If TCG is for any reason unable to effect delivery of the goods, reasonable steps would be taken to return the goods to the Customer and/or the Sender. The Customer and/or the Sender shall be responsible for the costs of carriage, attempted delivery and return of the goods. No goods will be received or accepted by TCG including radioactive materials which are or may become dangerous, inflammable or noxious, or which by their nature are or may become liable to cause injury or damage to any person, goods or property whatsoever without TCG’s consent in writing prior to the goods being tendered. Should TCG consent to the movement of any of the above, the containers or packaging must be marked accordingly as to comply with the applicable legislation, regulations or requirements of any authority. TCG reserves the right to destroy any of the above should the necessary consent not be confirmed in writing prior to the goods being tendered. Whether or not the Customer and/or the Sender was aware of the nature of the goods and whether or not TCG’s written acceptance thereof was obtained, The Customer and/or the Sender shall be deemed to have indemnified TCG against loss, damage or liability caused by TCG as a result of the tender of the goods to TCG. TCG shall not transport any prohibited goods including without limitation any goods and materials, the carriage of which is prohibited by any laws, rules and/or regulations. In the event that the Customer and/or the Sender consigns such items with TCG, the Customer and/or the Sender shall indemnify TCG against all claims, damages or losses arising in connection herewith and TCG shall have the right to deal with such items as it shall see fit including the right to abandon carriage of the same immediately upon TCG having knowledge that such items infringes on these conditions. The Customer and/or the Sender shall be responsible and liable, without limitations for all costs, fines, damages, loss of income and/or legal costs which TCG may incur as a result of the Customer and/or the Sender’s breach of this clause. Under No circumstances will TCG accept liability for goods of this nature, and customer and/or sender must provide written proof that the goods in question are comprehensively insured with a reputable insurer for the duration of the carriage of the goods prior to the goods being taken into TCG’S care, custody and control. TCG does not provide insurance to the Customer. However, subject to the terms and conditions herein and only in particular stated instances, TCG will assume liability for any loss suffered by a Customer in respect of the items specified in the waybill subject to an additional charge being levied in respect thereof, and provided further that the Customer has indicated specifically that such assumption of liability is required. In the event that the Customer has indicated on the waybill that assumption of liability by TCG is required and the declared value exceeds R2,500.00 (TWO THOUSAND FIVE HUNDRED RAND), the fee charged for assumption of liability by TCG shall be 2% of the declared value but not exceeding R30,000.00 (THIRTY THOUSAND RAND). In the event that a Prepaid Customer has indicated that assumption of liability is required and the declared value exceeds R1,000.00 (ONE THOUSAND RAND) the fee charged for assumption of liability by TCG shall be 2% of the declared value. TCG is not responsible for the packaging of the customer’s parcel/s and shall not, under any circumstances be liable for any loss or damage to a parcel/s which was not adequately and appropriately packaged to withstand the ordinary rigors and risk of courier transit and road transportation. TCG shall not courier or accept liability for any parcel exceeding the prescribed size limitation being 1m x 1m x 1m and 50kgs. TCG is not responsible for ordinary loss in weight or volume or ordinary wear and tear of the consignment. TCG is not responsible for loss, damage or expense caused by delay, even though the delay caused by a risk insured against. Claims shall only be considered if the waybill has been endorsed, i.e. confirming the damage / loss on delivery or endorsed to read “not unpacked and checked”. 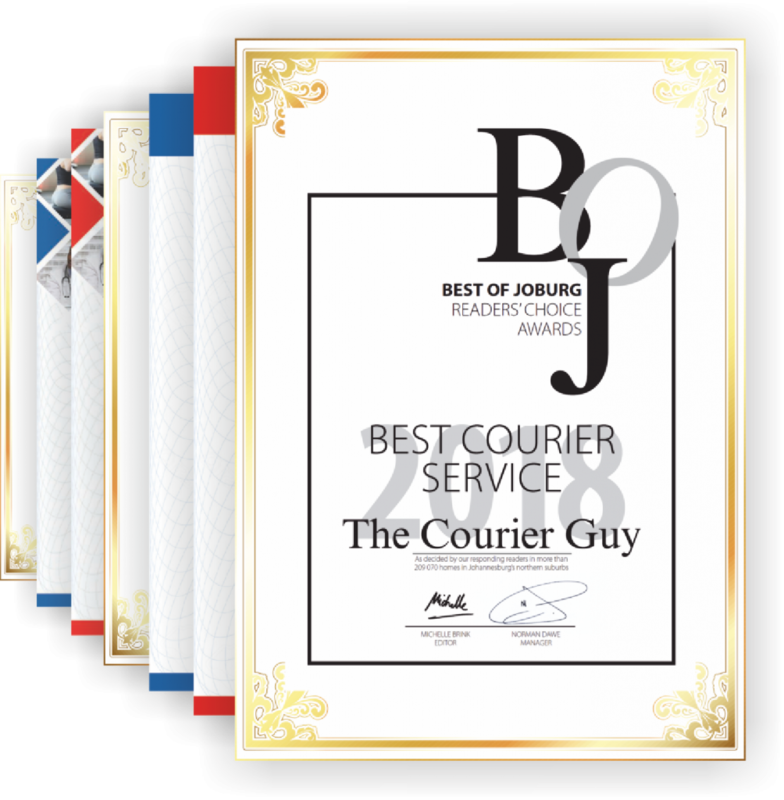 The Customer and/or Sender shall advise TCG in writing, strictly within 48 hours, of the damaged / lost or stolen goods being delivered/or expected to receive, at claims@thecourierguy.co.za. No claims will be entertained if not received within the 48 hour notice period. TCG’s assumption of liability for the declared value of any one parcel, shall not exceed R30,000.00 (THIRTY THOUSAND RAND). In the event that the declared value exceeds R30,000.00, special arrangements must be made with TCG. The declared value must be substantiated, by a purchase invoice or an up to date valuation certificate from a professional valuator. No assumption of liability by TCG is extended to the following: mechanical or electrical goods unless in brand new and original packaging. Antiques or antiquities of any description, arms, ammunition, live animals of any description, bank and treasury notes, bullion, bulk cargo of any description, cash, deeds, designs, documents, explosives, furs, gold bullion, silver nuggets, models, molds, patterns, plans, precious metals, specie, travelers cheques, brass and scrap metal, seafood, fresh produce, frozen goods, aircraft. All charges, including the fees charged, owing to TCG in respect of the assumption of liability will be payable to TCG as per the conditions of payment laid out in these conditions of carriage. The damaged goods must be returned to TCG together with the original invoice reflecting the purchase price (proof of value) of the item. These are required for assessment and/or salvage prior to consideration of a claim. Should the damaged goods and proof of value of item/s not be received by TCG, TCG shall not be obligated to honour its limited assumption of liability. In the event of a hi-jack or theft a minimum of 15% of the declared value will be charged. In the event of loss due to non-hi-jack or no theft a minimum of 10% (TEN PERCENT) of the declared value will for charged. The excess will automatically be deducted prior to settlement. When shipments are tendered for international destinations the provisions of and law to the Warsaw Convention may apply and in most cases, further limits the liability of TCG in respect of loss or damage to such consignments. In cases where non-payments of monies due to TCG occur, the Customer and/or the Sender shall be liable for and shall pay all legal costs incurred by TCG. The Customer and/or the Sender shall be liable for all costs incurred in the recovery of any monies hereunder, including collection commission, attorney and own client costs, whether incurred prior or during the institution of legal proceedings, or, if Judgment has been granted, in connection with the satisfaction or enforcement of such Judgment. No Relaxation or indulgence of these conditions of carriage shall in any way prejudice TCG’s rights nor shall they be deemed to be a waiver of any of TCG’s rights in terms of these conditions and no variation, waiver, indulgence and/or relaxation of such conditions shall be binding upon TCG. ” in the Credit Application as his domicilium citandi et executandi for all purposes relating to his agreement and may amend this in writing to TCG within seven (7) working days of the change. TCG shall be entitled, at its sole election, to institute any proceedings against the Customer and/or the Sender in any Magistrates Court having jurisdiction over it, even though the cause of action or amount claimed is beyond the jurisdiction of the court. This clause does not preclude TCG from, at its sole discretion and election, instituting action in the High Court and the Customer and/or the Sender also consents to the jurisdiction of the High Court in the jurisdiction elected by TCG. The Customer and/or the Sender shall be liable for all costs incurred by TCG in the recovery of any amount or the enforcements of any rights which it has hereunder, including collection charges and costs on an attorney and own client scale and cost of counsels as on brief whether incurred prior to or during the institution of legal proceedings or if Judgment has been granted in connection with the satisfaction or enforcement of such Judgments. The Customer and/or the Sender undertakes to pay the cost of the suretyship and cession contained herein including and stamp duty payable thereon and agrees that such costs can be debited to their account. Under no circumstances whatsoever including as a result of its negligent (including grossly negligent) acts or omissions or those of its servants, agents, or agents on whose behalf TCG, would be liable, in respect of any loss or damage sustained by the Customer and/or the Sender of any nature whatsoever or any damage caused to the assets of the Customer and/or the Sender or assets kept on its premises by any third parties or in regard to the Customer and/or the Sender’s business or sustained by any of its customers, howsoever caused including the negligent, grossly negligent , and acts or omissions of TCG, its services, agents or others for who it may be liable to in law. These terms and conditions (which by inference includes those agreements and conventions expressly referred to herein) constitute the entire agreement between the parties and shall prevail over, exclude and supersede any other terms or conditions, stipulations, warranties, statements of fact or opinion or representations, oral or written, whatsoever have been made or relied upon by either party other than as specifically included herein. The Sender expressly confirms that it does not rely upon or claim any other terms, warranties, conditions or representations relating to the use of TCG’s services under these terms and conditions . In the event that any term and/ or condition herein are proven to be invalid or unenforceable, then such term and/or condition shall not affect the validity or enforceability insofar as the remaining provisons of these terms and conditions are concerned.